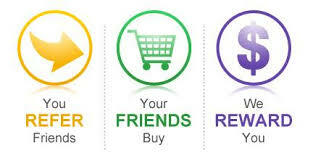 The Give $10 & Get $10 Rewards is an easy way for you to refer your friends every time you shop at Green Essence Living. Your referral friends are sent a $10 off coupon at no cost to you! Friends & Family all benefits by participating in the Give $10 & Get $10 Rewards - A coupon for you & One to share. Give your friends a $10 off coupon gift for their first order by logging into your existing account. Next click on the Give $10 & Get $10 Rewards icon on the bottom-right of the screen and send them a referral link. Your referral link gives your friends immediate access to the reward. Refer your friends and earn rewards! You get a $10 off coupon code when your friends make their first purchase. The Give $10 & Get $10 Rewards allows you to earn points and redeem reward points for purchasing products at GreenEssenceLiving.com. Sign in or create an account & you automatically receive reward points for every purchase! The Give $10 & Get $10 Rewards is an easy way for you to save big every time you shop at Green Essence Living. It's free and easy. Your $10 off coupon code can be easily retrieved by first logging into your existing account. Next click on the Give $10 & Get $10 Rewards icon on the bottom-right of the screen. Then just follow the screen prompts to retrieve your $10 off coupon code. Of course, you'll receive a copy of it via email as well to be used at checkout now or at a later date of your choosing. Then go to your popular brands, category page, or create a shopping cart of your favorite products. Give $10 & Get $10 Rewards is our way of rewarding our customers! You receive points for placing an order, celebrating a birthday, sharing your referral link with others, sharing on facebook, and sharing on twitter just to name a few! Start earning points for every item you purchase and when sharing GreenEssenceLiving.com with others! Create an account and instantly earn your first 200 points or $2.00 off coupon instantly. Please note that in order to participate in Give $10 & Get $10 Rewards, you must be a Green Essence Living customer. Enjoy exclusive benefits as a Green Essence Living customer every time you purchasing products at GreenEssenceLiving.com where giving is made easy and fun! Special Note: Green Essence Living reserved the rights to make changes to the Give $10 & Get $10 Rewards deemed necessary at anytime.